Porphyromonas gingivalis is a primary etiological agent of chronic periodontal disease, an infection-driven chronic inflammatory disease that leads to the resorption of tooth-supporting alveolar bone. We previously reported that TLR2 is required for P. gingivalis–induced alveolar bone loss in vivo, and our in vitro work implicated TNF as a key downstream mediator. In this study, we show that TNF-deficient (Tnf−/−) mice are resistant to alveolar bone loss following oral infection with P. gingivalis, and thus establish a central role for TNF in experimental periodontal disease. Using bone marrow–derived macrophages (BMDM) from wild-type and gene-specific knockout mice, we demonstrate that the initial inflammatory response to P. gingivalis in naive macrophages is MyD88 dependent and requires cooperative signaling of TLR2 and TLR4. The ability of P. gingivalis to activate cells via TLR2 or TLR4 was confirmed in TLR2- or TLR4-transformed human embryonic kidney cells. Additional studies using bacterial mutants demonstrated a role for fimbriae in the modulation of TLR-mediated activation of NF-κB. Whereas both TLR2 and TLR4 contributed to TNF production in naive macrophages, P. gingivalis preferentially exploited TLR2 in endotoxin-tolerant BMDM to trigger excessive TNF production. We found that TNF induced surface TLR2 expression and augmented TLR-induced cytokine production in P. gingivalis–stimulated BMDM, establishing a previously unidentified TNF-dependent feedback loop. Adoptive transfer of TLR2-expressing macrophages to TLR2-deficient mice restored the ability of P. gingivalis to induce alveolar bone loss in vivo. Collectively, our results identify a TLR2- and TNF-dependent macrophage-specific mechanism underlying pathogen-induced inflammatory bone loss in vivo. Periodontal disease (PD) is an infection-driven chronic inflammatory disease characterized by the resorption of tooth-supporting alveolar bone (1). PD is a common chronic infection affecting humans and a prevalent cause of tooth loss (2). Whereas several bacterial species are associated with PD, clinical and experimental evidence implicate Porphyromonas gingivalis as a primary etiological agent (1, 3). The more recent finding that P. gingivalis is a keystone pathogen driving the dysbiotic transformation of the oral microbiota further supports a direct association between P. gingivalis infection and PD pathogenesis (4). In addition, mounting evidence supports a role for P. gingivalis in the development of other chronic inflammatory diseases, including atherosclerosis, rheumatoid arthritis, and diabetes mellitus (5–9). Although the precise etiology of these diseases is multifactorial, involving both genetic and environmental factors, they share common pathophysiological features, including the presence of immune cell infiltrates at the site of inflammation consisting of activated macrophages, lymphocytes, and neutrophils that contribute to destruction of host tissues. The innate immune system serves as the first line of defense against microbial infection by initiating pathways that mediate inflammation and pathogen clearance (10). Innate immune cells, such as monocytes and macrophages, express germline-encoded pattern recognition receptors that sense conserved molecular motifs expressed by broad classes of microbes. TLRs are the primary pattern recognition receptors involved in the recognition of microbial ligands (11). TLR-ligand interaction triggers intracellular signaling events via the adaptor proteins MyD88 and/or Toll/IL-1R domain-containing adapter-inducing IFN-β (Trif), leading to rapid activation of acute inflammatory responses in macrophages (12). In addition, acute macrophage activation is mediated by receptors for inflammatory cytokines such as TNFRs. Engagement of both TLRs and TNFRs leads to activation of the transcription factor NF-κB and MAPKs, leading to expression of proinflammatory cytokines, chemokines, and microbicidal molecules (13). Although crucial for innate defense, excessive inflammatory cytokine production is detrimental to the host and contributes to the pathogenesis of inflammatory disorders (14, 15). Accordingly, endogenous mechanisms exist to limit inflammatory cytokine production and restore tissue homeostasis. The mechanisms by which mucosal pathogens like P. gingivalis overcome regulatory barriers to trigger inflammatory bone loss are not completely understood. Endotoxin tolerance is a key regulatory mechanism employed by macrophages to prevent excessive inflammatory cytokine production (16). Tolerance can be induced by prior exposure of macrophages to TLR ligands, as well as TNF, and results in the selective suppression of cytokines associated with toxicity and lethality upon restimulation (17). The underlying mechanisms involve downregulation of essential TLR signaling components, the expression of signaling inhibitors, as well as chromatin modifications at inflammatory loci (16, 18). These mechanisms are important at nonsterile mucosal surfaces such as the gut and oral cavity (19–21). Macrophage tolerance has also been documented in several inflammatory diseases (15), including PD (22), and most likely develops as a consequence of repeated immune stimulation. Several P. gingivalis outer membrane components have been identified as TLR ligands. For example, fimbriae, which are required for virulence in animal models of atherosclerosis (23–25), signal through both TLR2 and TLR4/MD-2 (26). Whereas innate immune cell activation by purified P. gingivalis ligands is well established, the effect of live bacteria is less understood (27, 28). In previous studies, our group and others have demonstrated that TLR2, but not TLR4, is required for P. gingivalis–induced inflammatory bone loss in vivo (9, 29, 30), and that in vitro macrophage-elicited osteoclastogenesis in response to live P. gingivalis required TLR2-dependent TNF production (31). Excessive TNF production is associated with multiple inflammatory disorders (32–34) and is involved in accelerated bone metabolism (35, 36). Clinical and experimental evidence also implicates TNF in the pathogenesis of PD (37, 38), but the role of TNF in pathogen-mediated PD has not been investigated in vivo in an established animal model of oral bone loss. In this study, using TNF-deficient mice, we demonstrate that TNF is a dominant cytokine driving P. gingivalis–induced inflammatory bone loss in vivo. TNF coordinated macrophage activation and inflammatory cytokine production following primary exposure to live P. gingivalis in vitro. Whereas TLR2 and TLR4 contributed equally to the induction of TNF in naive macrophages, P. gingivalis preferentially exploited TLR2 in tolerant macrophages to drive excessive production of TNF. We confirmed our in vitro findings by demonstrating that adoptive transfer of TLR2-expressing macrophages into Tlr2−/− mice restores the ability of P. gingivalis to induce inflammatory bone loss in vivo. Our results identify a TLR2-dependent cell-specific mechanism underlying pathogen-mediated inflammatory bone loss. Specific pathogen-free (6- to 8-wk-old) male C57BL/6 (wild-type [WT]) and Tnf−/− mice were purchased from The Jackson Laboratory (Bar Harbor, ME). Tlr2−/− and Tlr4−/− mice were originally provided by Dr. S. Akira (Osaka University, Osaka, Japan), and bred in house. All mice were on the BL/6 background. All experimental procedures were conducted in accordance with Boston University Institutional Animal Care and Use Committee approvals. Frozen stocks of WT P. gingivalis strain 381, the major fimbriae mutant (DPG3), the minor fimbriae mutant (MFI), and the major and minor fimbriae double-mutant (MFB) were grown anaerobically at 37°C on blood agar plates (Remel) for 3–5 d (39). Plate-grown organisms were used to inoculate liquid cultures of brain heart infusion broth (Becton-Dickinson Biosciences) supplemented with yeast extract (0.5%; Becton-Dickinson Biosciences), hemin (10 μg/ml; Sigma-Aldrich), and menadione (1 μg/ml; Sigma-Aldrich). Erythromycin (5 μg/ml) and/or tetracycline (1 μg/ml) were added according to the selection requirements of the P. gingivalis fimbriae mutant strains. Liquid cultures were grown anaerobically for 18–24 h and harvested at mid to late log phase. Cells were washed three times in PBS before use. Aliquots of P. gingivalis were fixed in 4% paraformaldehyde (Electron Microscopy Sciences) and stored at 4°C until processed. DMEM, RPMI 1640, penicillin/streptomycin solution, and CellStripper were purchased from Cellgro. FBS was purchased from HyClone. Fluorochrome-conjugated anti-mouse CD11b (M1/70), F4/80 (BM8), CD45 (30-F11), NK1.1 (PK136), CD19 (1D3), CD3ε (145-2C11), Ly6G (RB6-8C5), TLR2 (T2.5), TLR4 (UT41), receptor activator for NF-κB ligand (RANKL) (IKK22/5), TNF (MP6-XT22), and the appropriate isotype-matched control Abs were purchased from eBioscience. Ultra-pure Escherichia coli LPS 0111:B4 and Pam3CSK4 (Pam3) were purchased from Invivogen. Mouse rTNF was purchased from R&D Systems. Sterile thioglycolate was purchased from Remel. WT, Tlr2−/−, Tlr4−/−, Myd88−/−, and Trif−/− immortalized bone marrow–derived macrophages (iBMDM) were provided by D. Golenbock (University of Massachussetts Medical School, Worcester, MA) and maintained in RPMI 1640 containing 10% FBS, 2 mM L-glutamine, 10 mM HEPES, 0.5 μM 2-ME (MP Biomedical), 100 U/ml penicillin, and 100 μg/ml streptomycin (complete RPMI [cRPMI]). Human embryonic kidney (HEK)293 cells stably cotransfected with TLR2 and a NF-κB response element-secreted embryonic alkaline phosphatase reporter gene (HEK-TLR2) or TLR4/MD-2 and a NF-κB response element-luciferase reporter gene (HEK-TLR4) were purchased from Invivogen and maintained in complete DMEM. WT, Tlr2−/−, Tlr4−/−, Myd88−/−, and Trif−/− iBMDM (2 × 106/ml/well) were seeded in 6-well tissue culture dishes in antibiotic-free cRPMI and stimulated with P. gingivalis (multiplicity of infection [MOI] = 10), E. coli LPS (100 ng/ml), or Pam3 (1 μg/ml) in the continuous presence of brefeldin A (10 μg/ml). For blocking experiments, cells were pretreated with 20 μg/ml anti-mouse TLR2 (T2.5) or isotype-matched rat IgG (eBioscience) for 1 h prior to stimulation. After 6 h, iBMDM were harvested and assayed for TNF induction by intracellular cytokine staining, as described below. Bone marrow cells from WT, Tlr2−/−, Tlr4−/−, and Tnf−/− mice were cultured in cRPMI supplemented with 20% L929 conditioned medium. After 7 d, bone marrow–derived macrophages (BMDM) were harvested, plated (2 × 105 cells/ml) in antibiotic-free cRPMI, and stimulated with P. gingivalis 381 or DPG3 (MOI = 10), E. coli LPS (100 ng/ml), Pam3 (1 μg/ml), murine rTNF (20 ng/ml), or medium alone for 6–24 h. Where indicated, BMDM were pretreated with E. coli LPS (100 ng/ml) or TNF (20 ng/ml) to induce an endotoxin-tolerant state prior to stimulation with P. gingivalis. Supernatants were collected and stored at −80°C for subsequent analysis. Cells were harvested and processed for flow cytometry. Spleens from naive WT, Tlr2−/−, and Tnf−/− mice were harvested to obtain a single-cell suspension. After erythrocyte lysis, splenocytes were washed with PBS seeded in cRPMI (4 × 106 cells/ml) in 24-well tissue culture plates and stimulated with fixed P. gingivalis at MOI = 10 for 6–24 h. For the detection of intracellular cytokines, brefeldin A (10 μg/ml) was added to the cultures for the last 4–6 h to inhibit cytokine secretion. Nonadherent cells were removed by aspiration, and adherent cells were detached with CellStripper and pooled with the nonadherent fraction. Cells were then processed for flow cytometry and intracellular cytokine staining. For analysis of monocytic cells in splenocyte cultures, a hierarchal gating strategy was employed (detailed in Supplemental Fig. 1). Briefly, a gate was placed liberally on CD11b+ cells. The gated population was purged of contaminating cells with a lineage mixture consisting of anti-mouse, as follows: CD19 (B cells), CD3 (T cells), NK1.1 (NK cells), and Ly6G (granulocytes). HEK-TLR cells were seeded in 96-well plates in antibiotic-free complete DMEM at 2.5–4 × 104 cells/well and stimulated with 10-fold increasing concentrations of WT P. gingivalis or isogenic fimbriae mutants (104–108 CFU/ml), E. coli LPS (0.001–10 μg/ml), or Pam3 (0.001–10 μg/ml) for 18–24 h. Supernatants from HEK-TLR2 cells were collected and assayed for NF-κB reporter gene activity using the QUANTI-Blue detection kit, according to the manufacturer’s protocol. HEK-TLR4 cells were lysed and NF-κB reporter gene activity was measured using the Luciferase Assay System (Promega). For all experiments, 10% FBS was used and served as a source of soluble CD14. Reporter activity in stimulated cells was normalized to that of unstimulated controls and expressed as fold induction. All incubations with fluorochrome-conjugated Abs were performed at 4°C. Cells were washed in staining buffer (PBS, 1% BSA, 0.01 NaN3) and incubated with anti-mouse CD16/32 (eBioscience) for 15 min to block Fc receptors and reduce nonspecific binding. Staining for extracellular Ags was performed for 30 min on ice. Where applicable, cells were fixed, permeabilized, and stained for intracellular TNF using a kit (Cytofix/Cytoperm; Becton-Dickinson Biosciences), according to the manufacturer’s protocol. Samples were acquired on a BD LSRII flow cytometer, and data were analyzed using FlowJo (Tree Star). For analysis, samples were gated on light scattering properties to exclude dead cells and debris, and isotype-matched control Abs were used to delineate positive staining and set quadrant markers. Six- to 8-wk-old male mice were given sulfamethoxazole (0.87 mg/ml) and trimethoprim (0.17 mg/ml) (Sulfatrim; Goldline Laboratories, Fort Lauderdale, FL) ad libitum in their drinking water for 2 wk, followed by a 2-d antibiotic-free period. Mice were then infected by oral topical application of P. gingivalis at the buccal surface of the maxillae three times at 2-d intervals with 109 CFU live P. gingivalis in 100 μl vehicle consisting of PBS containing 2% carboxymethylcellulose as a carrier. Sham-infected controls received the antibiotic pretreatment and three sham infections with vehicle alone. Six weeks after the final treatment, mice were euthanized by CO2 inhalation. Cephalons were fixed for 24–48 h in 4% buffered paraformaldehyde and stored at 4°C in 70% ethanol until evaluation by microcomputed tomography. For adoptive transfer experiments, Tlr2−/− mice received a single i.v. tail vein injection containing 107 WT or Tlr2−/− BMDM in 100 μl PBS immediately following the first infection. Experimental peritonitis was induced in WT and Tnf−/− mice by i.p. injection with 3 ml sterile thioglycolate solution. After 4 d, peritoneal exudate cells were collected from the peritoneal cavity with 10 ml ice-cold PBS. RBCs were depleted by hypotonic lysis, and live nucleated cells were counted by microscopy using the trypan blue exclusion method. Cells were stained and processed for analysis by flow cytometry, as described above. For quantitative three-dimensional analysis of alveolar bone loss, maxillae were examined by a desktop micro-CT system (μCT 40; Scanco Medical AG, Bassersdorf, Switzerland). The sagittal plane of the specimens was set parallel to the x-ray beam axis. The specimens were scanned at a resolution of 12 μm in all three spatial dimensions. Raw images were converted into high-quality dicoms and analyzed using computer software (Amira 5.2.2; Visage Imaging). Residual supporting bone volume was determined for the buccal roots using a direct three-dimensional approach. The apical basis of the measured volume was set mesio-distally parallel to the cemento-enamel junction and bucco-palatinally parallel to the occlusal plane. Results represent residual bone volume (mm3) above the reference plane (120 μm below the cemento-enamel junction) in individual hemimaxillae. Data were evaluated by ANOVA with the Dunnet multiple-comparison test using GraphPad Prism v5. Where appropriate (comparison of two groups only), two-tailed t tests were also performed. Statistical differences were considered significant at the level of p < 0.05. To examine the contribution of TNF to P. gingivalis–induced oral bone loss, we used a well-characterized mouse model of PD that uses alveolar bone loss as a measurable outcome (40). WT and TNF-deficient (Tnf−/−) mice were orally infected with P. gingivalis or vehicle alone, and alveolar bone volume was measured by μCT 6 wk later (Fig. 1A). Alveolar bone resorption is necessary for normal tooth eruption and root morphogenesis, both of which rely on intact receptor activator for NF-κB signaling (41). Tnf−/− mice exhibited normal tooth eruption (Fig. 1D, 1E) and root morphology (data not shown). Alveolar bone volume was comparable in sham-infected WT and Tnf−/− mice. Oral infection with P. gingivalis induced significant bone resorption in WT mice compared with sham-infected controls (p < 0.001; Fig 1B, 1C). In contrast, P. gingivalis failed to induce measurable bone loss in Tnf−/− mice compared with their respective controls (Fig. 1D, 1E). These data indicated that TNF is a key cytokine driving P. gingivalis–induced oral bone loss in vivo, and implicate dysregulated TNF production in this process. TNF deficiency confers resistance to P. gingivalis–induced oral bone loss. WT and Tnf−/− mice were orally infected with P. gingivalis or vehicle alone (sham infected), and alveolar bone loss was assessed by μCT 6 wk later. (A) Alveolar bone volume in hemimaxillae from sham-infected and P. gingivalis–infected WT and Tnf−/− mice. Representative three-dimensional reconstructions of hemimaxillae from sham-infected WT (B), P. gingivalis–infected WT (C), sham-infected Tnf−/− (D), and P. gingivalis–infected Tnf−/− (E) mice. Data are expressed as bone volume ± SD from n = 8 mice per group and are representative of two independent experiments yielding similar results. ***p < 0.001, compared with sham-infected control; NS, No significant difference. To address the contribution of specific immune cells to TNF production, we stimulated splenocytes from naive WT mice with P. gingivalis and identified TNF-responsive cells using a combination of intracellular cytokine staining and lineage-specific surface markers. TNF was not readily detectable in unstimulated cells (Fig. 2A). After stimulation with P. gingivalis for 6 and 24 h, TNF production was observed in ∼1% and ∼2% of splenic leukocytes, respectively (Fig. 2B, 2C). At both time points, TNF expression was largely restricted to CD11bhigh leukocytes (Fig. 2B, 2C). As a negative control, splenocytes from Tnf−/− mice were used (Fig. 2D). Subsequent gating on TNF+ cells revealed that >95% of these cells coexpressed the macrophage marker F4/80 (Fig. 2D, 2E). Collectively, our in vitro data suggest that macrophages are the primary source of TNF in response to P. gingivalis. Macrophages are the chief producers of TNF in P. gingivalis–stimulated mixed leukocyte cultures. Splenocytes from naive WT mice were left unstimulated (A) or stimulated with P. gingivalis (MOI = 10) for 6 (B) or 24 h (C). Samples were surface stained for CD11b and F4/80, followed by intracellular staining for TNF, and then analyzed by flow cytometry. For analysis, samples were first gated by light scatter to exclude dead cells and debris. Quadrant markers were set using appropriate isotype-matched control Abs, and the specificity of intracellular cytokine staining was validated in P. gingivalis–stimulated splenocytes from Tnf−/− mice (D). Numbers in right-hand quadrants indicate the percentage of TNF+ splenocytes. (E and F) CD11b and F4/80 expression gated on TNF+ cells after 6 (E) or 24 h (F) of stimulation. Quadrant numbers represent the percentage of TNF+ cells within the indicated gates. Data are representative of two independent experiments yielding similar results. To investigate the role of TLRs and downstream signaling adapters in TNF production and macrophage activation induced by P. gingivalis in vitro, we used iBMDM. iBMDM exhibited appropriate TNF responses to TLR2 and TLR4 ligands (Fig. 3A). iBMDM from WT, Tlr2−/−, Tlr4−/−, Myd88−/−, and Trif−/− mice were incubated with P. gingivalis or medium alone, and TNF induction was measured by intracellular cytokine staining (Fig. 3B). TNF was not detected following treatment with media alone. P. gingivalis induced the production of similar levels of TNF in WT and Trif−/− cells, whereas TNF production was abrogated in Myd88−/− iBMDM. TNF production was significantly reduced in P. gingivalis–stimulated Tlr2−/− and Tlr4−/− cells as compared with WT cells. Blocking TLR2 signaling with a TLR2 neutralizing Ab reduced TNF production in WT and Trif−/− iBMDM and abolished TNF production by Tlr4−/− iBMDM. 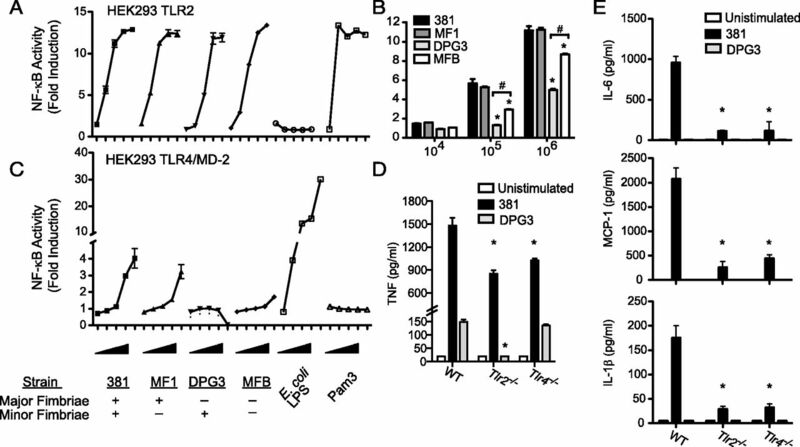 These results demonstrate that P. gingivalis–induced macrophage activation is MyD88 dependent and requires TLR2 and TLR4. P. gingivalis–induced TNF production is mediated through activation of TLR2 and/or TLR4 and is MyD88 dependent. (A) iBMDM from WT, Tlr2−/−, Tlr4−/−, Myd88−/−, and Trif−/− mice were stimulated with E. coli LPS (100 ng/ml), Pam3 (1 μg/ml), or (B) P. gingivalis (MOI = 10) in the presence or absence of a TLR2 neutralizing Ab (20 μg/ml), and TNF induction was determined by intracellular cytokine staining after 6 h. Media-treated cells served as unstimulated controls and were used to determine baseline autofluorescence (indicated by dotted horizontal lines). Bars represent MFI ± SD from triplicate cultures. Experiments were repeated twice with similar results. *p < 0.05 compared with WT. We next examined the role of major and minor fimbriae in TLR-mediated activation of NF-κB by P. gingivalis whole bacteria using a cell-based reporter assay. WT P. gingivalis (381) or isogenic bacterial mutants lacking the major (DPG3), minor (MF1), or both (MFB) fimbriae were used to stimulate HEK293 transfected with TLR2 (Fig. 4A, 4B) or TLR4/MD2 (HEK-TLR4/MD2) (Fig. 4C). Pam3 and E. coli LPS were used as positive controls for activation of TLR2 and TLR4, respectively. E. coli LPS failed to induce NF-κB activity in TLR2-transfected cells (HEK-TLR2) (Fig. 4A). Stimulation of HEK-TLR2 with Pam3 induced NF-κB reporter activity in a dose-dependent manner. Similarly, all bacterial strains tested induced dose-dependent NF-κB reporter activity in TLR2-expressing cells achieving saturation at concentrations >107 CFU/ml. However, P. gingivalis strains expressing major fimbriae (381, MF1) were significantly more potent in activating NF-κB at concentrations <107 CFU/ml (Fig. 4B). Interestingly, MFB exhibited greater reporter activity than DPG3 at equal concentrations (Fig. 4B). These results indicated that major fimbriae promote TLR2-driven activation of NF-κB by P. gingivalis whole cells, and suggest the minor fimbriae suppress TLR2-dependent responses. The ability of bacteria devoid of fimbriae (MFB) to activate NF-κB in HEK-TLR2 indicates that other P. gingivalis products also act as TLR2 ligands, but major fimbriae are preferentially recognized in a concentration-dependent manner. Fimbriae modulate TLR-induced cell activation by P. gingivalis whole cells. HEK293 cells stably transfected with TLR2 (A, B) or TLR4/MD-2 (C) were stimulated with 10-fold increasing concentrations (104–108 CFU/ml) of WT P. gingivalis (381) or isogenic bacterial mutants lacking the minor (MF1), major (DPG3), or both (MFB) fimbriae and assayed for NF-κB reporter activity after 18 h. Cells stimulated with 10-fold increasing concentrations of Pam3 and E. coli LPS served as positive controls for activation of TLR2 and TLR4, respectively. Data are mean ± SD of triplicate cultures and expressed as fold induction relative to unstimulated cells. *p < 0.05, compared with WT P. gingivalis (381); #p < 0.05, compared with fimbriae-null mutant (MFB). (D) ELISA of TNF in culture supernatants of WT, Tlr2−/−, and Tlr4−/− BMDM stimulated with WT P. gingivalis (MOI = 10), DPG3, or media alone (unstimulated) for 6 h. (E) ELISA of IL-6, MCP-1, and IL-1β in culture supernatants of WT, Tlr2−/−, and Tlr4−/− BMDM stimulated with WT P. gingivalis (MOI = 10:1), DPG3, or media alone for 24 h. Data are expressed as the mean ± SD of triplicate cultures. All data are representative of two independent experiments with similar results. *p < 0.05, compared with WT. Stimulation of HEK-TLR4/MD2 cells with E. coli LPS, but not Pam3, induced a robust dose-dependent increase in NF-κB activation (Fig. 4C). Although significantly less potent than E. coli LPS, WT P. gingivalis or the minor fimbriae mutant (MF1) also induced TLR4-dependent NF-κB activity in a dose-dependent manner (Fig 4C). In contrast, bacteria expressing minor fimbriae alone (DPG3) caused a dose-dependent decrease in basal reporter activity, a phenotype that was absent in the double fimbriae mutant (MFB). TLR4-driven NF-κB activity was not significantly altered in cells stimulated with MFB. These results indicated that the major fimbriae are required for TLR4-dependent activation of NF-κB by P. gingivalis whole cells, and suggest that minor fimbriae suppress TLR4-dependent NF-κB activity. To explore this possibility, we tested the ability of P. gingivalis strains to inhibit E. coli LPS-induced activation of NF-κB in TLR4-MD2–expressing HEK cells. Whereas all strains were able to inhibit LPS-induced NF-κB activity, strains expressing minor fimbriae exhibited the most potent inhibitory activity (Supplemental Fig. 2). Taken together, these data demonstrated that major fimbriae promote TLR2- and TLR4-dependent activation of NF-κB by P. gingivalis whole cells, and suggest that minor fimbriae function to suppress TLR2- and TLR4-dependent activation of NF-κB. We next used primary BMDM from WT, Tlr2−/−, and Tlr4−/− mice and compared their innate immune responses to WT P. gingivalis or the major fimbriae mutant DPG3. WT P. gingivalis was significantly more potent in inducing TNF production than DPG3 in WT and TLR-deficient macrophages. TNF secretion induced by WT P. gingivalis was reduced in Tlr2−/− and Tlr4−/− BMDM compared with WT BMDM. In contrast, DPG3 induced comparable levels of TNF in WT and Tlr4−/− BMDM, but not Tlr2−/− BMDM (Fig. 4D), consistent with the results obtained in the iBMDM. Stimulation of BMDM with WT P. gingivalis triggered the production of IL-6, IL-1β, and MCP-1 in WT macrophages, whereas it was significantly reduced in Tlr2−/− and Tlr4−/− BMDM (Fig. 4E). Similar to the suppression of TLR-dependent activation of NF-κB observed in transfected cells (Fig. 4B, 4C), DPG3 failed to induce detectable levels of IL-6, IL-1β, and MCP-1 in all cells tested (data not shown). Thus, macrophage inflammatory cytokine production in response to live P. gingivalis is largely dependent upon major fimbriae and requires the cooperative signaling of TLR2 and TLR4. TNF plays a key role in initiating and regulating macrophage cytokine production in response to infections in vitro and in vivo (42, 43). To explore the role of TLRs and TNF in the macrophage inflammatory response to P. gingivalis, we measured production of IL-6, IL-1β, and MCP-1 and of antimicrobial mediator, NO, by P. gingivalis–stimulated WT, TLR-, and TNF-deficient BMDM. 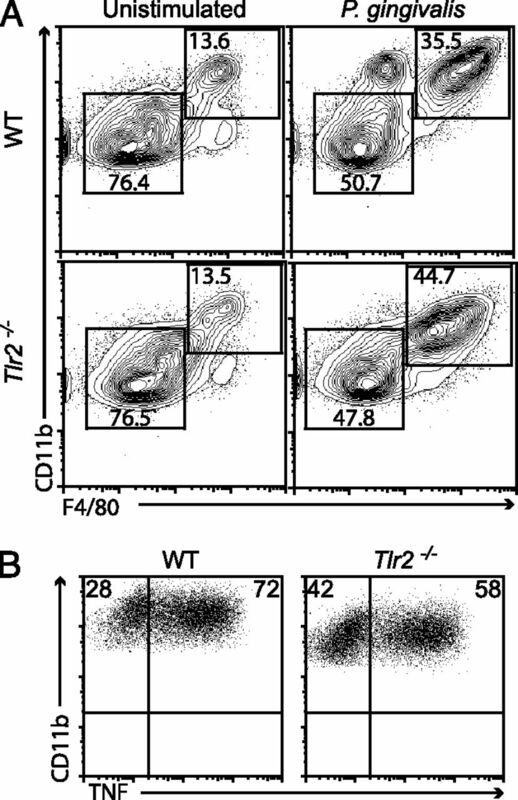 Production of IL-6, MCP-1, IL-1β, and NO was similarly inhibited in TLR2-, TLR4-, and TNF-deficient macrophages as compared with WT BMDM (p < 0.05; Fig. 5A). IL-6 and MCP-1 production by Tnf−/− BMDM stimulated with TLR2 or TLR4 ligands was comparable to that of WT BMDM, indicating that Tnf−/− macrophages are not inherently impaired in TLR-triggered cytokine production (Fig. 5B). TLR ligands were insufficient to induce the secretion of IL-1β in BMDM (data not shown), which requires two signals for its maturation (44), further indicating that macrophages were naive and devoid of contaminating activators of the inflammasome (data not shown). These data suggest that TNF signaling drives the majority of TLR-induced cytokine production in response to live P. gingivalis. TNF is a crucial mediator of the innate inflammatory response to live P. gingivalis in macrophages. BMDM from WT, Tlr2−/−, Tlr4−/−, and Tnf−/− mice were left unstimulated or stimulated with P. gingivalis (MOI = 10) for 24 h. (A) IL-6, MCP-1, and IL-1β in culture supernatants were assayed by ELISA, and NO2− production was measured using the Griess reaction. (B) BMDM from WT, Tlr2−/−, Tlr4−/−, and Tnf−/− mice were stimulated with Pam3 (1 μg/ml) or E. coli LPS (100 ng/ml) for 24 h, and culture supernatants were assayed for IL-6 and MCP-1. *p < 0.05, compared with WT. 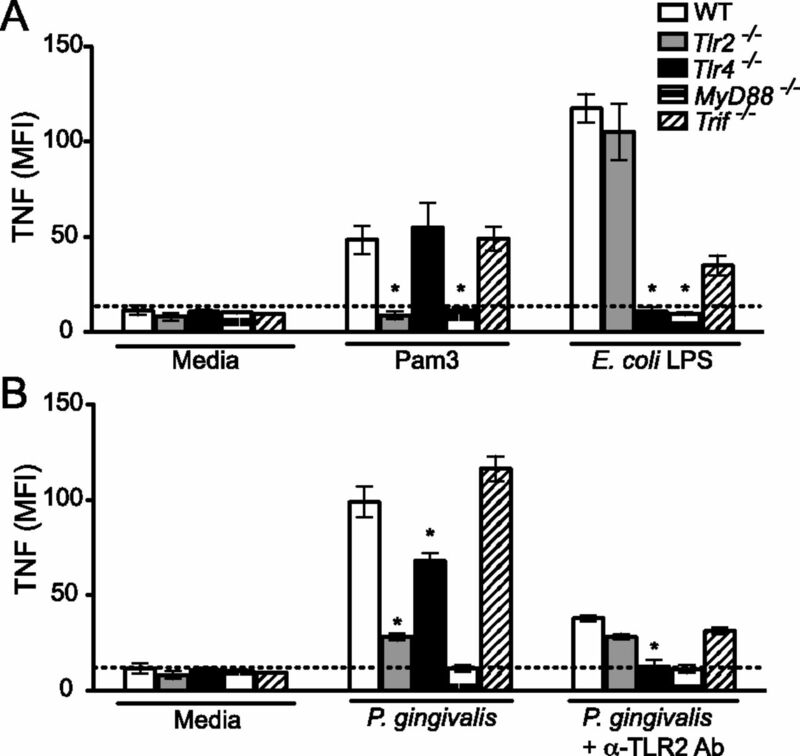 (C) BMDM from WT and Tnf−/− mice were left unstimulated or stimulated with P. gingivalis (MOI = 10), E. coli LPS (100 ng/ml), Pam3 (1 μg/ml), or mouse rTNF (20 ng/ml) for 24 h, and surface expression of TLR2 was measured by flow cytometry. **p < 0.01, compared with WT. Bars represent the mean ± SDs of triplicate cultures and are representative of two independent experiments. We previously demonstrated that P. gingivalis infection of macrophages leads to upregulated cell surface TLR2 expression (31). To investigate whether TNF signaling contributes to this, we stimulated BMDM from WT and Tnf−/− mice with P. gingivalis and measured surface TLR2 expression by flow cytometry (Fig. 5C). No difference in basal TLR2 expression was observed in unstimulated WT and Tnf−/− BMDM. Stimulation with P. gingivalis increased TLR2 expression in WT BMDM, which was significantly abrogated in Tnf−/− BMDM (p < 0.01), suggesting that TNF acts in an autocrine manner to induce surface TLR2 expression. Indeed, 24-h pretreatment with TNF increased surface TLR2 expression comparable to stimulation with P. gingivalis in WT and Tnf−/− BMDM. Similarly, 24-h pretreatment with LPS and, to a lesser extent, Pam3 increased surface TLR2 independently of TNF in BMDM. Thus, diverse stimuli that converge on the activation of NF-κB and MAPKs are capable of inducing surface TLR2. These results demonstrated that TNF contributes, at least in part, to increased TLR2 expression in response to live P. gingivalis, but not to that of TLR ligands. Collectively, these data reveal that TNF coordinates several aspects of macrophage activation in response to live P. gingivalis, including inflammatory cytokine production and surface expression of TLR2. Our finding that inflammatory stimuli of endogenous or microbial origin that are known to induce tolerance to subsequent TLR-triggered inflammatory responses (16, 17, 45) also induce surface TLR2 expression led us to investigate whether P. gingivalis preferentially exploits tolerant macrophages to drive excessive TNF production via TLR2. To address this, we pretreated WT and Tlr2−/− BMDM with LPS or TNF for 24 h to induce an endotoxin-tolerant state (17) and measured TNF production upon subsequent stimulation with P. gingivalis (Fig. 6). Macrophages pretreated with LPS were refractory to secondary stimulation with LPS as measured by TNF release, demonstrating that cells were effectively tolerized under the given conditions (Fig. 6A). Pretreatment with LPS inhibited TNF production following secondary challenge with P. gingivalis in Tlr2−/− cells, indicating cells were effectively tolerized by LPS. In contrast, LPS pretreatment of WT cells significantly enhanced P. gingivalis–induced TNF production (65% increase) relative to untreated controls (Fig. 6B). TNF pretreatment of Tlr2−/− BMDM had no effect on P. gingivalis–induced TNF induction compared with unprimed controls, whereas TNF-pretreated WT BMDM exhibited a 5-fold increase in cytokine production (Fig. 6B, 6C). Thus, similar to results obtained with LPS, TNF pretreatment failed to tolerize subsequent TNF production in WT macrophages. Taken together, these data indicate that P. gingivalis preferentially targets macrophages tolerized by inflammatory stimuli of endogenous or microbial origin to drive excessive TNF production via TLR2. P. gingivalis exploits tolerant macrophages to drive excessive TNF production through TLR2. (A) LPS-pretreated macrophages are refractory to secondary stimulation with LPS. WT BMDM were pretreated (1°) with E. coli LPS (100 ng/ml; +) or media alone (−) for 24 h. Cells were washed and restimulated (2°) with E. coli LPS (100 ng/ml; +) or media alone (−) for an additional 24 h, and TNF levels in cell culture supernatants were assayed by ELISA. Bars represent the mean ± SDs of triplicate samples. ***p < 0.001 by ANOVA; ND, not detectable. (B) ELISA of TNF in culture supernatants from WT and Tlr2−/− BMDM left untreated (−) or pretreated with E. coli LPS (L; 100 ng/ml) or TNF (T; 20 ng/ml) for 24 h (1°), and then stimulated with P. gingivalis for an additional 24 h (2°C). Data are expressed as percentage of nontolerized. (C) ELISA of TNF in culture supernatants from WT and Tlr2−/− BMDM pretreated with E. coli LPS (L; 100 ng/ml) or TNF (T; 20 ng/ml) for 24 h, and then stimulated with P. gingivalis (+) or media alone (−) for an additional 24 h. Data are expressed in pg/ml. Bars represent the mean ± SDs of triplicate samples and are representative of two independent experiments. ***p < 0.001, compared with WT. We and others have previously reported that TNF production by thioglycolate-elicited peritoneal macrophages is primarily dependent upon TLR2 (30, 31). Macrophages are drawn into the peritoneum in response to inflammation induced by thioglycolate and are exposed to inflammatory mediators in vivo. Given the role of TNF in leukocyte recruitment, we hypothesized that macrophages might be primed by TNF in vivo. To test this, WT and Tnf−/− mice were injected i.p. with thioglycolate, and 4 d later macrophage recruitment and phenotype were assessed by flow cytometry and compared with resting controls. The number of resident peritoneal exudate cells (PECs) (Supplemental Fig. 3A) and proportion of macrophages (Supplemental Fig. 3B) were similar in untreated WT and Tnf−/− mice. Resident peritoneal macrophages from WT and Tnf−/− mice expressed similar levels of CD11b, F4/80, and TLR2 (Supplemental Fig. 3C). However, Tnf−/− mice exhibited markedly reduced recruitment of macrophages following thioglycolate-induced peritonitis compared with WT mice. CD11b+ PECs from thioglycolate-treated WT mice were largely CD11bhighF4/80high macrophages expressing high levels of TLR2. In contrast, CD11b+ PECs from treated Tnf−/− mice were predominantly CD11bint F4/80int expressing intermediate levels of TLR2. These data demonstrate that TNF is critically involved in thioglycolate-elicited monocyte/macrophage recruitment and support the idea that TNF is an endogenous regulator of myeloid TLR2 expression during inflammation in vivo. These results also suggest that the observed discrepancy between elicited macrophages and BMDM may be due to in vivo priming by TNF. To confirm that resting monocytes/macrophages matured in vivo also produce TNF in response to P. gingivalis in a TLR2-independent manner, we used splenocytes from WT and Tlr2−/− mice as a source of monocytes and resident macrophages and assessed P. gingivalis–induced TNF production. To examine monocytic responses, a lineage mixture was used to exclude lymphocytes and granulocytes (Supplemental Fig. 1). In resting spleen cells, monocytic cells represent ∼5% of the CD45+ population (data not shown). Approximately 13% of monocytic cells are present as macrophages as determined by high expression of CD11b and F4/80, whereas the remainder are largely monocytes (∼76%) identified by their lower expression of CD11b and F4/80 (Fig. 7A). Stimulation with P. gingivalis prompted the differentiation of WT and Tlr2−/− splenic monocytes into macrophages, as assessed by increased expression of F4/80 (Fig. 7A). Consistent with our observations in naive BMDM, P. gingivalis induced TNF in both WT and Tlr2−/− splenic macrophages (Fig. 7B). P. gingivalis–induced TNF production in splenic macrophages. Splenocytes from naive WT and Tlr2−/− mice were left unstimulated or stimulated with P. gingivalis (MOI = 10) for 24 h. (A) Monocytic cell distribution in unstimulated and P. gingivalis–stimulated splenocytes. 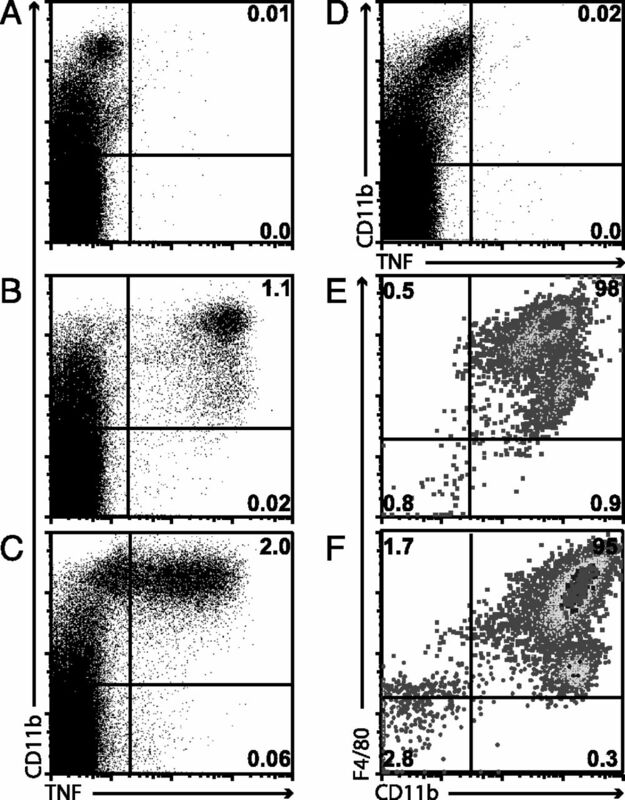 (B) TNF expression gated on CD11bhighF4/80high macrophages, as assessed by intracellular cytokine staining. Data are representative of two independent experiments with n = 3 mice/group. In addition to MyD88-dependent proinflammatory cytokine production, TLR2-dependent activation of monocytes/macrophages by P. gingivalis or its purified fimbriae triggers the activation of a CD11b/CR3-dependent proadhesive pathway (46–48). Consistent with previous reports, P. gingivalis–stimulated Tlr2−/− splenic macrophages exhibited reduced expression of CD11b compared with WT macrophages (Supplemental Fig. 4A). Diminished integrin activation in Tlr2−/− cells was associated with impaired macrophage spreading, as measured by an increase in forward light scatter characteristics (Supplemental Fig. 4B). Whereas integrins mediate dynamic leukocyte adhesion, macrophage spreading contributes to firm adhesion and retention within tissue (49). Thus, these data support the notion that TLR2 may also promote migration and retention of macrophages within tissue following infection with P. gingivalis. Studies have demonstrated that TLR2 is central to P. gingivalis-induced immunopathology, and Tlr2−/− mice are resistant to P. gingivalis–induced inflammatory bone resorption (9, 25, 29). We hypothesized that macrophages are a key TLR2-expressing cell driving alveolar bone resorption. To examine the contribution of TLR2-expressing macrophages to bone resorption in vivo, we performed adoptive transfer. Tlr2−/− mice were infected with P. gingivalis or vehicle alone and adoptively transferred with 107 WT or Tlr2−/− BMDM. Alveolar bone loss was assessed 6 wk later by μCT. Alveolar bone volume was comparable in sham-infected Tlr2−/− mice whether they received WT or Tlr2−/− macrophages, indicating that cell transfer did not impact bone volume in the absence of infection (Fig. 8A, 8B, 8D). P. gingivalis–infected Tlr2−/− mice receiving Tlr2−/− macrophages did not exhibit measurable bone loss compared with sham-infected controls (Fig. 8A, 8C). In contrast, P. gingivalis–infected mice receiving WT macrophages demonstrated significant bone loss compared with their respective controls (p < 0.001; Fig. 8A, 8E). Thus, adoptive transfer of TLR2-expressing macrophages is sufficient to restore P. gingivalis–induced inflammatory oral bone loss in Tlr2−/− mice. Coupled with our in vitro data, these results demonstrate that macrophages are a key TLR2-expressing immune cell mediating infection-driven bone loss. 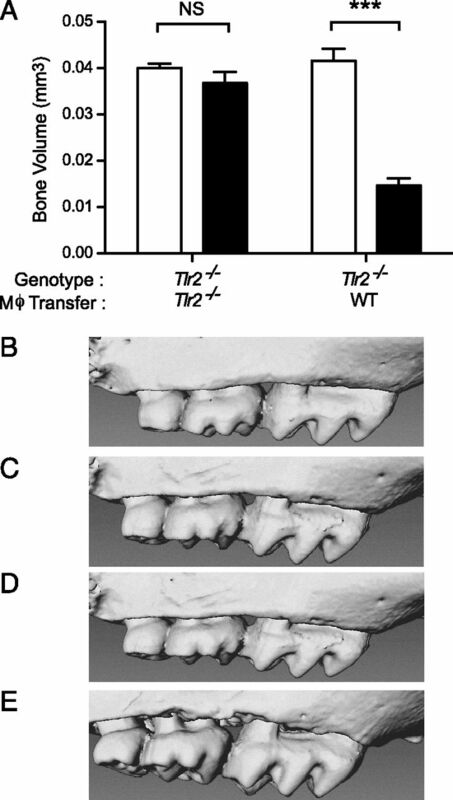 Adoptive transfer of TLR2-expressing BMDM restores oral bone loss phenotype in Tlr2−/− mice. Tlr2−/− mice were adoptively transferred (i.v.) 1 × 107 TLR2−/− or WT BMDM immediately after the oral challenge with P. gingivalis or vehicle alone and alveolar bone volume, as determined by micro-CT (A). Data are expressed as the mean bone volume ± SD from n = 6 mice per group. ***p < 0.01, compared with sham-infected control; NS, no significant difference. 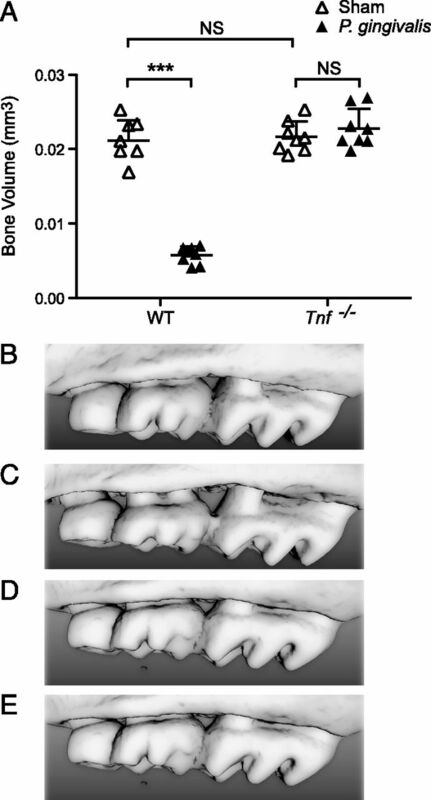 (B–E) Representative reconstruction of hemimaxillae from sham (B, D)- or P. gingivalis (C, E)–infected Tlr2−/− mice receiving Tlr2−/− (B, C) or WT (D, E) BMDM. In this study, we found that Tnf−/− mice were resistant to alveolar bone loss following oral infection with P. gingivalis, thus establishing a central role for this cytokine in an animal model of pathogen-mediated periodontal disease. Monocytes and macrophages were the main producers of TNF in response to P. gingivalis in vitro. Activation of naive macrophages by live P. gingivalis induced the rapid production of TNF that was dependent upon both TLR2 and TLR4 and required downstream TLR-adapter MyD88. In contrast, P. gingivalis preferentially exploited TLR2 in tolerant macrophages to drive excessive TNF production. We validated the significance of our in vitro findings by demonstrating that adoptive transfer of TLR2-expressing macrophages into Tlr2−/− mice restored the ability of P. gingivalis to induce oral bone loss in vivo. TNF works in synergy with RANKL to promote the activation and differentiation of osteoclasts (50, 51). TNF induces the expression of RANKL and IL-1α on osteoblasts and marrow stromal cells (52). IL-1α acts in a similar manner to promote osteoclast activation and differentiation (49). Indeed, IL-1α was found to mediate, at least in part, TNF-induced osteoclastogenesis in vivo (53). Similarly, the administration of soluble TNFR or IL-1R demonstrated similar therapeutic effects in a macaque ligature model of P. gingivalis–induced oral bone loss. Thus, the effects of TNF on P. gingivalis–induced inflammatory bone loss may be mediated in part by IL-1α. BMDM from TLR2-, TLR4-, or TNF-deficient mice were similarly impaired in their ability to produce key inflammatory cytokines (MCP-1, IL-6, and IL-1β) and antimicrobial mediators (NO) following stimulation with live P. gingivalis, suggesting that TNF acts in an autocrine manner to propagate TLR-induced cytokine production. Furthermore, our results established that TNF contributed to P. gingivalis–induced expression of TLR2, which was validated by the finding that BMDM treated with TNF alone responded by increasing surface TLR2 expression. In contrast, purified TLR ligands sufficiently induced the production of NF-κB–dependent cytokines and increased cell surface TLR2 expression in BMDM independently of TNF. This is in agreement with previous studies that have shown TNF, TLR2, and TLR4 ligands are capable of inducing cell surface TLR2 expression in mouse macrophages, and this coincides with NF-κB–dependent upregulation of TLR2 at the transcriptional level (54–58). Our results demonstrate that induction of TLR2 in response to P. gingivalis is only partially TNF dependent, and our previous studies indicate that purified fimbriae and P. gingivalis LPS can also induce TLR2 expression in macrophages (9), and most likely account for TNF-independent induction of TLR2. Nevertheless, although TLRs and TNFRs commonly induce inflammatory mediators via NF-κB and MAPKs, their function appears nonredundant in the macrophage response to P. gingivalis, establishing a previously unidentified TNF-dependent feedback loop. Emerging evidence indicates that functional redundancy exists among effector proteins from a single strain of bacteria (59). We previously demonstrated that purified major and minor fimbriae activate NF-κB in HEK293 cells transfected with TLR2 and TLR4/MD-2 with similar potencies (26). Several groups, including our own, have also documented that macrophage cytokine production in response to fimbriae requires TLR2 and TLR4, but how these proteins influence innate immune signaling in response to whole organism is not understood. Using a combination of fimbrial mutants, we found that the major and minor fimbriae reciprocally modulate TLR2- and TLR4-dependent activation of NF-κB by live P. gingivalis. Specifically, P. gingivalis strains expressing major fimbriae were more effective inducers of TLR2-dependent NF-κB activity, and major fimbriae were required for TLR4-dependent cell activation. TNF responses to WT P. gingivalis in BMDM required both TLR2 and TLR4, whereas TNF production in response to strains expressing minor fimbriae alone (DPG3) was exclusively dependent on TLR2. DPG3 exhibited inhibitory effects on TLR2- and TLR4-mediated activation of NF-κB when compared with bacteria devoid of fimbriae. Similarly, macrophage production of NF-κB–dependent cytokines (IL-6, MCP-1, IL-1β) was not detected in cells stimulated with DPG3 and required the expression of major fimbriae. Taken together, our data indicate that the minor fimbriae play a role in inhibiting TLR-driven cytokine production and NF-κB activity, which may explain the requirement for TNF in the macrophage response to WT P. gingivalis. Histological studies in humans have demonstrated that the inflamed periodontium is initially infiltrated by monocytes and macrophages expressing TLR2/TLR4 (22). As PD progresses into the chronic phases, TLR2 expression increases linearly with inflammation and resident macrophages are increasingly tolerant to TLR-dependent stimulation (22). Similarly, we found that pretreatment of BMDM with LPS or TNF, both of which induce tolerance to endotoxin, also upregulates surface TLR2 expression. P. gingivalis preferentially targeted TLR2 in BMDM tolerized by inflammatory stimuli to drive excessive production of TNF. TNF production by P. gingivalis–stimulated tolerant BMDM mirrored results obtained with thioglycolate-elicited macrophages. TNF played a dominant role in the recruitment and activation of macrophages in experimental peritonitis, indicating that elicited macrophages may be tolerized by TNF in vivo. 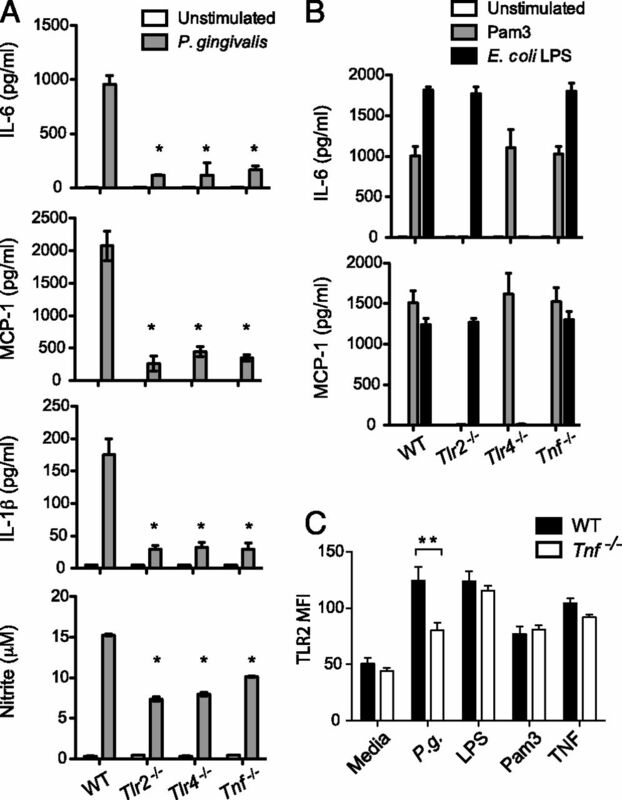 Elicited PECs from Tnf−/− mice exhibited markedly reduced TLR2 expression, suggesting that TNF is an endogenous regulator of myeloid TLR2 expression in response to inflammation in vivo. Collectively, our results indicate that P. gingivalis exploits host-protective mechanisms to drive excessive inflammatory cytokine production in a TLR2-dependent manner. The accumulation of macrophages at the site of inflammation plays a critical role in driving inflammatory tissue destruction. Migration of monocytes and macrophages to sites of inflammation requires dynamic integrin-dependent adhesion (60). In addition to MyD88-dependent proinflammatory cytokine production, P. gingivalis or its purified fimbriae activate TLR2-dependent inside-out signaling that leads to enhanced CD11b-mediated monocyte adhesion and transendothelial migration (61). In agreement with published work, we found that Tlr2−/− monocytes/macrophages fail to activate CD11b. Additionally, we found that TLR2 mediates P. gingivalis–induced macrophage spreading, which could contribute to the retention of macrophages within inflamed tissue. In support of this hypothesis, we recently reported that Tlr2−/− mice are partially protected from P. gingivalis–induced atherosclerosis and protection was associated with decreased infiltration of F4/80+ macrophages in arterial lesions (62). Thus, it is likely that TLR2-expressing macrophages contribute to P. gingivalis–induced oral bone loss through both proadhesive and proinflammatory pathways. In conclusion, our findings identify a TLR2-dependent macrophage-specific mechanism underlying infection-driven oral bone resorption, and our in vitro and in vivo studies suggest that this effect is mediated largely by TNF. TNF coordinated macrophage activation and inflammatory cytokine production following primary exposure to live P. gingivalis. Whereas TLR2 and TLR4 contributed equally to the induction of TNF in naive macrophages, P. gingivalis specifically exploited TLR2 in tolerant macrophages to drive the excessive production of TNF. We validated the significance of our in vitro findings by demonstrating that adoptive transfer of TLR2-expressing macrophages into Tlr2−/− mice restores the ability of P. gingivalis to induce inflammatory bone loss in vivo. This work was supported by National Institutes of Health Grant R01 DE019409 (to C.A.G.).
. 2005. Periodontal diseases. Lancet 366: 1809–1820.
. 2010. Accuracy of NHANES periodontal examination protocols. J. Dent. Res. 89: 1208–1213.
. 2004. Occurrence of Porphyromonas gingivalis and Tannerella forsythensis in periodontally diseased and healthy subjects. J. Periodontol. 75: 1077–1083.
. 2011. Low-abundance biofilm species orchestrates inflammatory periodontal disease through the commensal microbiota and complement. Cell Host Microbe 10: 497–506.
. 2007. Porphyromonas gingivalis mediated periodontal disease and atherosclerosis: disparate diseases with commonalities in pathogenesis through TLRs. Curr. Pharm. Des. 13: 3665–3675.
. 2010. Review: pathogen-induced inflammation at sites distant from oral infection: bacterial persistence and induction of cell-specific innate immune inflammatory pathways. Mol. Oral Microbiol. 25: 305–316.
. 2009. Porphyromonas gingivalis may play an important role in the pathogenesis of periodontitis-associated rheumatoid arthritis. Med. Hypotheses 72: 732–735.
. 2005. The effect of improved periodontal health on metabolic control in type 2 diabetes mellitus. J. Clin. Periodontol. 32: 266–272.
. 2008. Engagement of specific innate immune signaling pathways during Porphyromonas gingivalis induced chronic inflammation and atherosclerosis. Front. Biosci. 13: 2041–2059.
. 2004. Toll-like receptor signalling. Nat. Rev. Immunol. 4: 499–511. 2009. Microbe sensing, positive feedback loops, and the pathogenesis of inflammatory diseases. Immunol. Rev. 227: 248–263.
. 2011. Tumor necrosis factor induces GSK3 kinase-mediated cross-tolerance to endotoxin in macrophages. Nat. Immunol. 12: 607–615.
. 2005. Oral tolerance and regulation of mucosal immunity. Cell. Mol. Life Sci. 62: 1322–1332.
. 2011. Interactions between the host innate immune system and microbes in inflammatory bowel disease. Gastroenterology 140: 1729–1737.
. 2007. Chronic stimulation of Nod2 mediates tolerance to bacterial products. Proc. Natl. Acad. Sci. USA 104: 19440–19445.
. 2005. Oral mucosal endotoxin tolerance induction in chronic periodontitis. Infect. Immun. 73: 687–694.
. 1994. Inactivation of the Porphyromonas gingivalis fimA gene blocks periodontal damage in gnotobiotic rats. J. Bacteriol. 176: 1052–1059.
. 2004. Innate immune recognition of invasive bacteria accelerates atherosclerosis in apolipoprotein E-deficient mice. Circulation 109: 2801–2806.
. 2007. Fimbrial proteins of Porphyromonas gingivalis mediate in vivo virulence and exploit TLR2 and complement receptor 3 to persist in macrophages. J. Immunol. 179: 2349–2358.
. 2008. Bacterial fimbriae stimulate proinflammatory activation in the endothelium through distinct TLRs. J. Immunol. 180: 2187–2195.
. 2005. Cytokine profiling of macrophages exposed to Porphyromonas gingivalis, its lipopolysaccharide, or its FimA protein. Infect. Immun. 73: 935–943.
. 2007. Identification of signaling pathways in macrophage exposed to Porphyromonas gingivalis or to its purified cell wall components. J. Immunol. 179: 7777–7790.
. 2006. Cutting edge: TLR2 is required for the innate response to Porphyromonas gingivalis: activation leads to bacterial persistence and TLR2 deficiency attenuates induced alveolar bone resorption. J. Immunol. 177: 8296–8300.
. 2011. The C5a receptor impairs IL-12-dependent clearance of Porphyromonas gingivalis and is required for induction of periodontal bone loss. J. Immunol. 186: 869–877.
. 2008. Macrophage-elicited osteoclastogenesis in response to bacterial stimulation requires Toll-like receptor 2-dependent tumor necrosis factor-alpha production. Infect. Immun. 76: 812–819. 2008. TNF-mediated inflammatory disease. J. Pathol. 214: 149–160. 2005. TNF pathophysiology in murine models of chronic inflammation and autoimmunity. Semin. Arthritis Rheum. 34(Suppl. 1): 3–6.
. 2010. Transcriptional control of the TNF gene. Curr. Dir. Autoimmun. 11: 27–60. 2011. Anti-TNFα therapy and prevention of bone loss in rheumatoid arthritis. IBMS BoneKEy 8: 154–158.
. 2005. TNF-alpha and pathologic bone resorption. Keio J. Med. 54: 127–131.
. 1998. IL-1 and TNF antagonists inhibit the inflammatory response and bone loss in experimental periodontitis. J. Immunol. 160: 403–409.
. 1997. Lipopolysaccharide-stimulated osteoclastogenesis is mediated by tumor necrosis factor via its P55 receptor. J. Clin. Invest. 100: 1557–1565.
. 2006. Fimbria-dependent activation of pro-inflammatory molecules in Porphyromonas gingivalis infected human aortic endothelial cells. Cell. Microbiol. 8: 738–757.
. 1994. Oral infection with Porphyromonas gingivalis and induced alveolar bone loss in immunocompetent and severe combined immunodeficient mice. Arch. Oral Biol. 39: 1035–1040.
. 1999. OPGL is a key regulator of osteoclastogenesis, lymphocyte development and lymph-node organogenesis. Nature 397: 315–323.
. 2004. TNF influences chemokine expression of macrophages in vitro and that of CD11b+ cells in vivo during Mycobacterium tuberculosis infection. J. Immunol. 172: 6846–6857.
. 2002. TNF regulates chemokine induction essential for cell recruitment, granuloma formation, and clearance of mycobacterial infection. J. Immunol. 168: 4620–4627. 2010. The inflammasomes: mechanisms of activation and function. Curr. Opin. Immunol. 22: 28–33.
. 2009. Induction of distinct TLR2-mediated proinflammatory and proadhesive signaling pathways in response to Porphyromonas gingivalis fimbriae. J. Immunol. 182: 6690–6696.
. 2006. Porphyromonas gingivalis fimbriae proactively modulate beta2 integrin adhesive activity and promote binding to and internalization by macrophages. Infect. Immun. 74: 5658–5666.
. 2005. Integrin activation by bacterial fimbriae through a pathway involving CD14, Toll-like receptor 2, and phosphatidylinositol-3-kinase. Eur. J. Immunol. 35: 1201–1210.
. 2009. CD36 modulates migration of mouse and human macrophages in response to oxidized LDL and may contribute to macrophage trapping in the arterial intima. J. Clin. Invest. 119: 136-145.
. 2000. TNF-alpha induces osteoclastogenesis by direct stimulation of macrophages exposed to permissive levels of RANK ligand. J. Clin. Invest. 106: 1481–1488.
. 2002. TNFalpha potently activates osteoclasts, through a direct action independent of and strongly synergistic with RANKL. Endocrinology 143: 1108–1118.
. 2004. Marrow stromal cells and osteoclast precursors differentially contribute to TNF-alpha-induced osteoclastogenesis in vivo. J. Immunol. 173: 4838–4846.
. 2005. IL-1 mediates TNF-induced osteoclastogenesis. J. Clin. Invest. 115: 282–290.
. 2008. TLR2 expression in astrocytes is induced by TNF-alpha- and NF-kappa B-dependent pathways. J. Immunol. 181: 3841–3849.
. 2007. Tumor necrosis factor-alpha (TNF-alpha) regulates Toll-like receptor 2 (TLR2) expression in microglia. J. Neurochem. 103: 1461–1471.
. 2002. Transcriptional regulation of the human Toll-like receptor 2 gene in monocytes and macrophages. J. Immunol. 168: 5629–5637.
. 2000. Regulation of Toll-like receptor 2 expression by macrophages following Mycobacterium avium infection. J. Immunol. 165: 6308–6313.
. 2001. NF-kappa B and STAT5 play important roles in the regulation of mouse Toll-like receptor 2 gene expression. J. Immunol. 166: 4516–4524.
. 2011. Modulation of NF-κB signalling by microbial pathogens. Nat. Rev. Microbiol. 9: 291–306.
. 1990. The role of the type 3 complement receptor in the induced recruitment of myelomonocytic cells to inflammatory sites in the mouse. Am. J. Respir. Cell Mol. Biol. 3: 3–10.
. 2008. Tumor necrosis factor blockers influence macrophage responses to Mycobacterium tuberculosis. J. Infect. Dis. 198: 1842–1850.
. 1997. Characterization of tumor necrosis factor-deficient mice. Proc. Natl. Acad. Sci. USA 94: 8093–8098.